Benetton Inferno Paradiso Pink fragrance is a Floral fragrance for women. 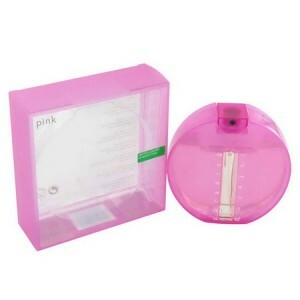 Benetton Inferno Paradiso Pink 100ml. Eau De Toilette is a Floral fragrance for women. Paradiso Inferno Pink was launched in 2004. Introduced by the design house of Benetton. This feminine Inferno Paradiso Pink perfume posesses a blend of: Notes of orange, ylang-ylang, cedar and pink rose. Perky and cheerful, youth flavor Benetton Paradiso Inferno Pink for Women was born in 2004. Unusual bottle bright pink speaks of playfulness, lightness and charm of its owner. This fragrance like a girl relaxed, accustomed to act decisively, guided only by the call of the heart. She is graceful and cheerful, smile generously surrounding people. For such a woman as perfect trendy and modern fragrance Muse de Rochas. As part of the flavor of Benetton Inferno Paradiso Pink for Women beautiful sound initial notes of citrus, orange and green. "Heart" is a bouquet of ylang-ylang, jasmine and rose. Base composition is woven of sandalwood, musk, white cedar. a fragrance for women, belongs to a group of floral fragrances. Paradiso Inferno Pink released in 2004 Top notes of citrus, orange and green notes; middle notes are jasmine, rose and ylang-ylang; base notes are white cedar, musk and sandalwood.